Android OS by Google reached its current dominant position in the mobile OS market primarily by three factors, 1st one, an open source environment to work with, 2nd one, Google’s backing, and last but not the least, the app ecosystem. In Android OS, you can get apps for virtually anything that comes to mind, ranging to Launchers, to Travel Guides, Browsers, Video Players, Music Players, Themes etc. 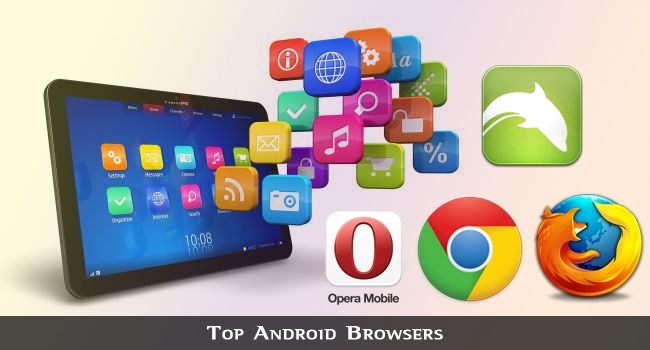 One of the very important app category in Android is the Browser category. Browser is the application which allows you to browse the internet and its vast collection of web sites and web apps. Normally, majority of Android Devices come with the stock AOSP Browser (the one provided in Google’s Android source code), sometimes with little tweaks from the OEM brand. However, not all people are satisfied with the stock browsing experience on a device, and for them, the Google Play Store is waiting, with tons of great alternative browsers, one of which will surely cater to their exact need. In this post, we go through the top 5 Browsers for the Android OS, discussing their feature set, pros and cons, device support and price. Opera Mini is one of the oldest web browsers for mobile phones. Even before Android OS was launched, Opera Mini was available for a vast majority of mobile OSes, including Windows Mobile, Symbian, iOS, BlackBerry and even for Java based phones. Opera Software toutes their Opera Mini as “the world’s fastest Android browser” and we can’t really contradict their statement. Opera Mini has quite an extensive feature set, including social network integration, multi tab support, history, bookmarks, page suggestions, search suggestions etc. Opera Mini’s only downside is the relatively worse rendering capability, especially in complex HTML5 or Flash based web pages, but those downsides aren’t really noticed by most of us out there. Opera Mini supports a vast number of Android Devices, and Android versions ranging from Android 1.5 Cupcake to the latest Android 4.3 Jellybean. Dolphin Browser is by far, the best browser on the Play Store. Its ratings and number of installs speak for itself. Dolphin Browser has quite a number of tricks up its sleeves, including Gesture control, voice control, sidebars, quick tab switching and Add-Ons support. Dolphin is a very fast browser, rendering pages, kinetic scrolling are executed without lags even on old, weak devices, as well as on newer power houses. Dolphin has its own Web App store, with a huge collection of Add-Ons, themes, wallpapers, and over 200 web app collection, including Facebook, Twitter, Amazon, Wikipedia and much much more. You can visit a web page from Dolphin by just making a touch gesture, or by speaking into the voice control feature. You can do a lot more by Dolphin by using its Add-Ons. Popular Add-Ons include Web to PDF, Password Manager, DesktopToogle etc. Dolphin is compatible with a vast number of Android Devices, and Android OS version 2.0.1 and up. 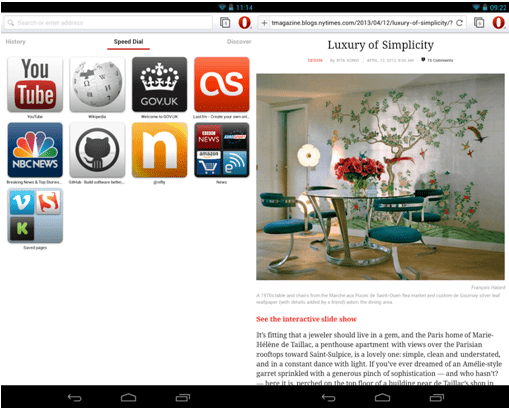 Opera Mobile is functionally the same as Opera Mini, with a huge added benefit. It brings the whole Chromium web browser engine to your mobile, leading to huge benefits in terms of rendering performance and security. 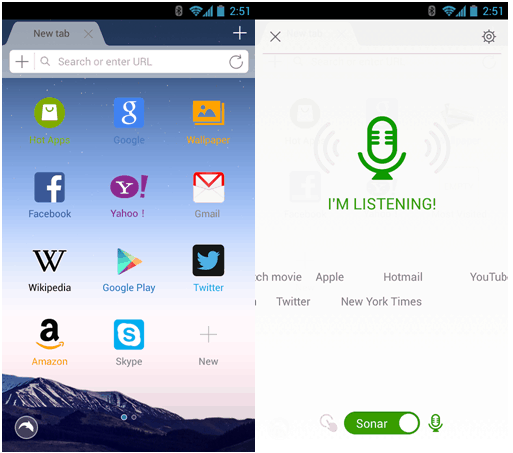 Opera Mobile has an extensive feature set, including multi tab support, Download Manager, private browsing mode, bookmarks, history management and what not. Opera Mobile also features an Off-Road Mode, which basically enables pre rendering and compression of the web page in Opera’s proxy server. The only downside of the Opera Mobile over Opera Mini is that the heavier browsing engine, while renders better, is hard on the resources, so older devices may be a bit laggy, while newer ones will work just fine. 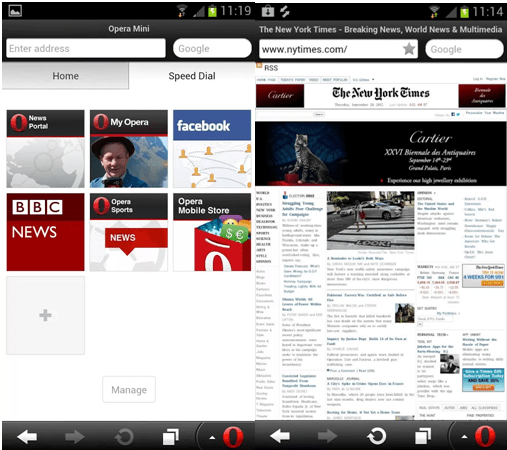 Opera Mobile supports all Android Devices running Android 3.0 Honeycomb and up. For older devices, there is a version called Opera Mobile Classic, which uses the older, but still good enough, Opera Presto browser engine for rendering pages. Who doesn’t know Firefox? The web browser giant, Mozilla entered Android ecosystem a while back, porting over their Gecko engine to Android for usage in Firefox Browser for Android. Firefox features blazing fast rendering, even on older devices, thanks to Mozilla’s highly optimized rendering engine. The engine is very competent in rendering HTML5 based pages too. Firefox features quite a standard feature set, including multi tab, syncing with the desktop Firefox application, Private Browsing mode etc. Another interesting feature in the mobile Firefox browser is the support for Add-Ons, just like the desktop counterpart. Some of the popular Add-Ons include AdBlock Plus, Last Pass Password Manager, NoScript, Foursquare etc. 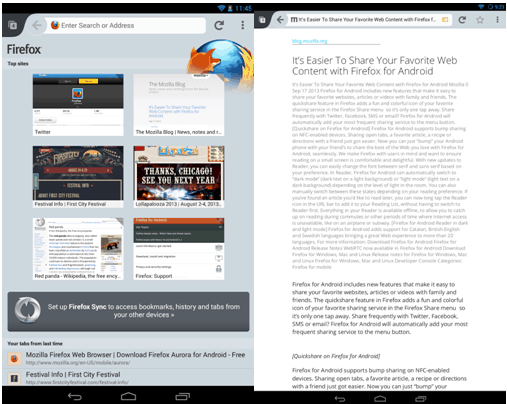 Firefox supports almost all Android devices running on Android OS 2.2 Froyo and up. Also, Mozilla has released a Firefox Beta version on Google Play Store which allows users to live on the bleeding edge, and test new work in progress features. Everybody knows about this one. Google Chrome, renowned as a speedy, light weight and resource friendly PC browser, is also available for Android Devices. Like its PC counterpart, Google Chrome on Android features blazing fast browsing, with the Chromium Engine, and full Google Search integration in the Omnibox (the combination of search and address bar first introduced in Chrome for PC). Chrome is perhaps, the only Android browser which can open unlimited number of tabs (as long as your device can handle it), with easy tab to tab navigation with swipe gestures. Chrome features easy sync of your web history, bookmarks, favorites with your PC and other Chrome devices via Google Sync. Chrome is also known for its security, and it features a Private Incognito mode too. In addition to HTML5, Chrome also supports WebGL and WebSockets, resulting in an immersive browsing experience to the end user. Chrome supports all Android devices running Android 4.0 ICS and above. In addition to that, Google has also released a beta version, which allows users to have a sneak peek at what is cooking at Google’s Chrome development. 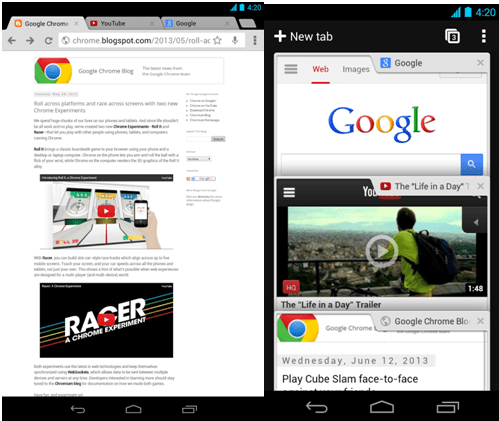 This list sums up the 5 best Android Browsers out there. There are many other worthy alternatives, including UC Browser, Boat Browser, Maxthon Browser, so one or the other is sure to fit the bill for any Android OS user out there. Bro please add some minimum requirement for these browsers because FireFox and Chrome are not configurable with my Android device Samsung Galaxy s5360..
@Rajesh we’ve already added the minimum requirements for each browser. Firefox works fine on Gingerbread. And Chrome needs ICS and above. These are already mentioned in the article. I have used all these browsers and found Opera Mini the fastest among them. It is very fast even for slower 2G networks and works well on less powerful smartphones too. Google Chrome is really good too. Very sleek and fast, just like its Desktop counterpart. Thanks for sharing this list for best Android browsers. Well, you have provided just normal browsers which have been recommended by hundreds of other websites, nothing new in that. There is only so many browsers one can list. There are not many other good browsers, certainly not something which can make it to the top 5 list. “you have provided just normal browsers” They are normal to you, but they are the Top listed browsers. Is there any one of them that did not make it to the top 5? please do share it with us here. All these browsers are of top quality and they’ll surely rule over other browsers in many more years to come . Thanks for sharing this list with us. I use chrome, but didn’t knew about the others. Thanks for your descriptions. I’ve been having some trouble with multiples tab in chrome. I will try opera to see how it acts. Thanks for sharing some good android browsers. Your shared browsers are good but still I love UC browser for android. I think you need to list UC browser. It’s really fast and amazing. Yeah, UC Browser is good, but it has issues with renedring desktop pages properly. That is why I didn’t list it. But it did make it to the other noteworthy browsers. Thanks for listing out good number of browsers, I was using chrome and firefox so far, now gonna download dolphin and opera too because I surf a lot from my phone. Opera mini is the best. I have been habituated with this browser since i was using a simple touch screen Nokia phone and now when i have started using Android, i have the best speed experience with Opera. So i prefer it the most. Thanks for listing other browsers also. I think those browsers are not new but you just provided a great post about their information. I think Opera Mini is really great one, especially for smartphones those days. thank for your post. Keep looking for your new article. I just use Firefox and chrome and they both works fine, I haven’t try some of the browsers but I think all of them works great. I think that Chrome is the way to go for browsing in Android. Nice list,but you miss out UC web browser. UC browser work very nicely on android. It’s really a very informative post and the way you describe about those Android Browser is very nice. Dolphin Browser is the best one I have used ever. And here I can’t see the UC Browser on the list. Have you missed it? It should be on the list. i want to know that is they work fine on lollipop and marshmallow?? Thanks for your post-Shaunak Guharay. 1) Almost many smartphone mobile manufacturers created their own browsers and they integrated into to their custom OS version together with Google chrome. 2) All the android antivirus manufacturers are compulsory supported for google chrome only. And few manufacturers are giving support to other browsers.